North Korea’s Kim Jong-un reportedly makes public appearance. Kim Jong-un casually strolled back onto the scene—with a slight limp—on Tuesday, according to North Korea’s state run media. Speculation swirled about Kim’s grasp on power and the leader’s health since he went off the grid last month following his last public appearance at a concert on Sept. 3. 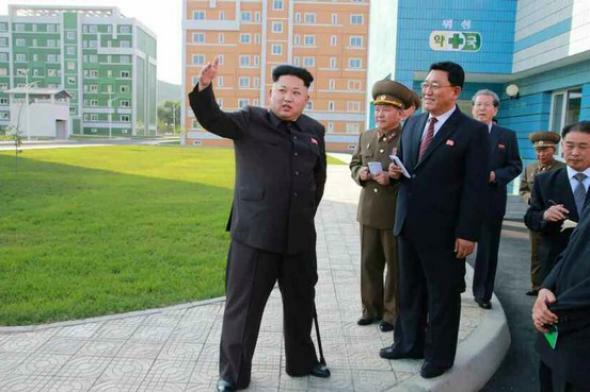 The [newspaper] report said Mr. Kim was giving “field guidance” at a new residential area for scientists. Such reports are a staple of North Korean state media and are designed to show the leader is signing off on major projects or giving final additional instructions. By showing Mr. Kim walking with a cane, the images appeared to confirm that the leader has had problems with his legs, as has been suspected by officials in Seoul. Media reports, citing unnamed intelligence officials, said Mr. Kim has had surgery for ankle problems. Other reports have suggested he has had gout… The report showing Mr. Kim’s reappearance was published on Tuesday but wasn’t dated, as is common with North Korean state media. As such, it couldn’t be confirmed exactly when Mr. Kim was shown but the images were the first of him in public since he appeared at a concert on Sept. 3. “Looking over the exterior of the apartment houses and public buildings, decorated with diverse coloured tiles, (Mr Kim) expressed great satisfaction, saying they looked very beautiful,” the North Korean news agency reported, according to the BBC. This is, presumably, Kim’s “great satisfaction” look.